Last week I received the “Irristibly Sweet Award” by Talei – Musings of An Aspiring Scribe, who is quite a sweetheart. She definitely deserved to receive it, and I’d like to thank her for passing it on to me. The rules state that I am to reveal seven sweets that I cannot resist. Considering I have quite a sweet tooth, picking seven is just a drop in the bucket of sugary treats. 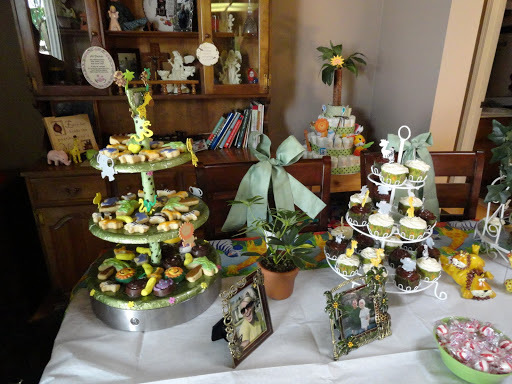 Look at all the goodies that tempted everyone at my daughter’s baby shower on Saturday. Apple dumplings fresh out of the oven. My mom baked these when I was a kid, and then I baked them when my kids were growing up. Hmm, I suppose I should teach my daughters how to make apple dumplings so they can pass this delicious treat on to the grandkids. Watermelon – Sometimes I can eat half a watermelon in a day, in two sittings. Banana splits with all the toppings. If I was still skinny, I’d eat these every day instead of once a year. Dr. Pepper – What can I say? Yep, I’m a Pepper, too. Great, now I’ve got the tune stuck in my head. Caramel apples – I can eat these all year long, not just in the fall. Cracker Jack – You don’t have to take me to a ballgame to buy me this old time favorite. A box from a local store works for me. As long as it comes with a prize! Creme brulee – I’m sure glad Talei listed this as one of her favorites because it saved me time looking up the spelling! But, hey, creme brulee, how could anyone not love such an amazing dish? Chocolate anything – chocolate cake, chocolate pudding, chocolate ice cream, chocolate-covered raisins, chocolate pretzels, chocolate popcorn, chocolate pickles. Just kidding. I’ll draw the line there, but you get my drift! I’m supposed to pass this on to five others, but I’ve been tagged for something else and need to save some people to tag for that. So, Katie, J.L., and Maria, if you would like to pass this award on to five instead of four, then go for it! How about the rest of you? Is there one specific all-time sweet dessert that you want to leave in a comment and make everyone drool over? I’ll be back in a jiff. After blogging about all these desserts, well, I just can’t resist the chocolate ice cream in the freezer that’s calling my name! If I had some Dr. Pepper, I could make a chocolate Pepper float. Yum! Congratulations on the award! I adore Mississippi Mud Pecan pie. It has to be the best pie in the world. I only make it once or twice a year because it has so much sugar in it…but boy is it worth it. Congrats Lynn. She's right, you are super sweet.Sweet treats: See's Candy – pecan buds and divinity, banana cheesecake (sounds strange but OMG is it good), sour watermelon gummy candy, Safeway's chewy chocolate cookies from their bakery. That's five, I could go on but thinking about it makes me want it and I don't have enough reserve points to be able to eat them without dire consequences. You're all making me hungry. I need to eat breakfast! Sharon, I love pecan pie but never heard of mud pecan pie. What's the mud part?Yes, Katie, gotta try some creme brulee! Congratulations on the award! :)Watermelon is good–but if I had to pick a melon, I'd have to go with cantaloupe! I have a fondness for anything creamy like Boston Cream pie. Ooh and speaking of pie, pumpkin! Plus chocolate… Now I want dessert!! I make quite a stir about Hot Fudge Sundaes. They have to be made with really good ice cream, really good and gooey hot fudge, and they have to be served in a glass dish. I WILL NOT abide a plastic cup for my Hot Fudge Sundae. Since I've embarrassed friends and relatives over the lack of perfection in this dessert, I try to order it when I'm alone. It's the only thing I'm adamant about in food and that's probably because I have maybe one a year, so it has to be the absolute best. Thanks, everyone!Golden Eagle, I love cantelope, too, but I'm allergic to it now. I really miss it! Lisa – Oh, yes, creamy is good. I love cream puffs!Lee – Yes, your hot fudge sundaes sound delicious, and if you only eat about one per year, then, yep, gotta go all out!J.L., – You're welcome. I'm looking forward to hearing about your seven favorite sweets!Hi Alana – That's funny that chocolate pickles sounds good! Who would have thought to add bacon to ice cream sundaes, but it seems to be a big hit at Denny's Restaurant! Haha!I think I gained a couple pounds just reading these comments!I'm leaving for a couple days, so I'll catch up on everyone's new posts when I get back. Thanks for the award, Lynn! Tis irrisistibly sweet of you! One of my fave pic books is "Chocolate Tina." About a girl who loves chocolate everything, then one morning she wakes up and is made of chocolate! The story is like eating a fistful of M & M's. Melts in your heart, not in your hands. :-)Oops! Cakepops dipped in chocolate and rolled in nuts just popped into my mind! Thanks so much for the award Lynn!!! !Your baby shower treats look amazing!! !mmmm….I am not picky when it comes to sweets I luv em all!!! Maria and Rhonda, you're welcome! Have fun with the award post. I did!